While there is debate about NC as a concept, it is one of the few answers we have. Organizations around the world are moving to implement it because of rapidly increasing ecological destruction. But there is much to be done, and progress is slow. There are opportunities to accelerate and improve Natural Capital based on innovative systems solutions for business and policy alike. Solutions that not only conserve nature but puts the front runners of NC in a position of significant advantage, both in business and policy. 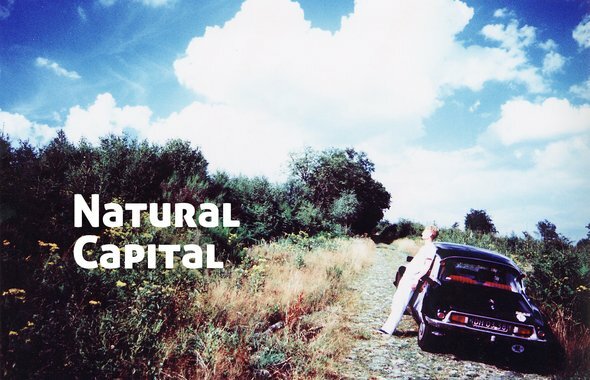 The concept of Natural Capital has been around for more than a century and is not without controversy. Debate about its ethical foundations has been going on for decades, raising ethical questions without clear answers, but the global decline of nature pressures us for action. Nature currently has limited economic value, causing it to be regularly sacrificed. This 'tragedy of the commons' plagues conservation efforts and the debate has delayed solutions resulting in preventable losses. "We use nature because it gives us value, and we destroy it because it's free. Nature should be given the rightful value it deserves, it’s the only real way we can safeguard our natural resources for the future." Because NC is one of the few tools that allows direct action to be taken, the message is to implement it as fast as we can. How can we do this? The challenge can be summarized as follows; what mechanisms can we use to make natural capital work, how to value nature in all its facets, and how to create an advantage for policy and business for rapid implementation. What mechanisms make Natural Capital work? The solution supported by the largest NGO's introduces national NC profit and loss balance sheets in each country and company, and tracks this balance as is done with finance. These balance sheets express Natural Capital both in terms of quantity and quality of resources (amounts of forests, water, biodiversity, etc), and, where possible, as currency. For every asset that disappears from the balance sheet, something else needs to be brought back. This functions to increase awareness and transparency about the state of our natural resources, and improves their management. When successful, Natural Capital Accounting (NCA) injects a balancing system for our planet’s physical limits to growth into an economy currently aimed at capitalizing on limitless growth. "We do not need to be entirely correct in our assessment of Natural Capital. Even if we're only 80% or even 50% in the ballpark, that’s at least better than the value of zero we have currently. We need to act, now, to prevent further losses to an already marginalized system, regardless of not being able to accurately value Natural Capital." This is undoubtedly the greatest challenge of Natural Capital as a concept. What value does a tree have? Ask a hundred scientists and economists and you will get a hundred different answers. In order for NC to work, we need to agree on a basis of valuation. A tree is worth more than just the price of its wood, as it provides a home to many animals, it acts as shade in summer, it buffers and filters rainwater, it cleans the air, and it also supplies a number of other ecosystem services. It may also be valuable in other terms, for example culturally, and for its role in the ecosystem as a whole. Therefore, the value of a tree in its entirety isn’t the same as the price for its wood in the store, and can be expressed in a different manner, for example in liters of water buffered and filtered, its contribution to biodiversity and well being, and so on. Quite a few studies have attempted to account for some of these values and converted them into currency. Research conducted by Johnson and Wardle gave the Canadian Boreal forest a value of US$ 3.7 trillion for all of its ecosystem services and carbon sequestration. Another study from 1997 by Costanza et. al put a pricetag of US$ 33 trillion on the world’s biosphere’s ecosystem services. These and other studies give starting points for value estimation, while there are certainly large gaps to cover. To find and fill these gaps, a more inclusive framework to assess value is necessary. The Symbiosis in Development (SiD) systems analysis framework is such a tool. It can be used to assess the full spectrum of value for any given subject, including the relational values of the system as a whole. Its flexible structure allows room for future discovery while providing clarity to start valuing with limited insight today. Using SiD the value of the tree can be seen on three 'scales': the object (direct physical) value, the value of its network (services and relations), and its systemic value as a whole. The first being the easiest to assess, and the last the hardest but having the most impact. Combining these three scales results in a estimation of the tree’s Natural Capital value. 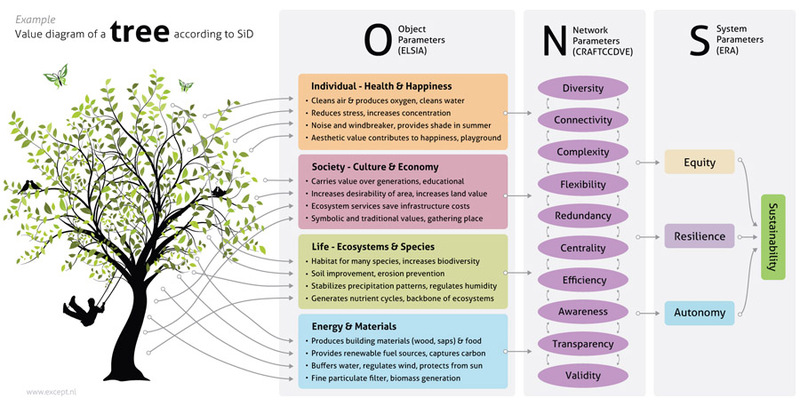 This diagram is a simplified example of the structure of SiD’s value assessment when applied to a tree. Using SiD, there are opportunities for other values to join the party, such as transparency, diversity, health, and wellbeing. SiD reserves room for these values, allowing them to be slotted in once research makes them available. Because it is a universal framework, it works for other measurements as well, allowing it to be inclusive of other movements such as social justice or poverty alleviation and stand stronger together. This flexibility prevents the system becoming solidified once adopted, preventing perverse incentives that occur when real value and value in the system are dissonant (an issue that plagues carbon trading). Tracking the flexibility of the Natural Capital system is therefore essential. There are frameworks for valuation, which can be filled in using existing research. Then incentives are needed for organizations to implement them. Using systemic innovation strategies, the most effective approaches can be explored. As a trial, a small interdisciplinary team at Except, a sustainability strategy firm, held a short systems exploration session and came up with a few approaches. It was discovered that effective solutions are those that make Natural Capital a base economic requirement for growth, rooting it into the core of the economy. One approach is to create a secondary currency backed by Natural Capital rather than gold. This means Natural Capital is not expressed in Dollars, Euros or Yen, but in its own currency, for example called the GreenBack. This currency is purely digital, relying on similar technology as BitCoin, and coupled to the balance sheets of nations, capturing both qualitative and quantitative values in separate indicators. When demand for this GreenBack goes up, a direct increase in demand for Natural Capital results. This creates a natural marketplace where the only way to grow wealth is to grow Natural Capital. This currency thus couples economic growth to its necessary precursor: the resources our planet needs to sustain economic growth. Solutions like these accelerate the implementation of Natural Capital, but both business and government have their own challenges. What are the opportunities for countries and companies to implement NC? Several projects researching the role of NC in policy are underway, for example TEEB, a global research project through the European Union. But progress is slow, hampered by lack of oversight, tools for valuation, accessible knowledge databases, and stakeholder awareness. These challenges can be more effectively solved with innovative systems-thinking than traditional approaches, saving resources and time. And time is of the essence here. One way to speed up the process is to apply distributed innovation mechanisms, such as crowd-solutioning and serious gaming. These approaches have managed to resolve in weeks highly complex problems such as unraveling the secrets of protein folding, which previously took teams of scientists many years. If strategies such as these were to be applied to the issues that hold back Natural Capital, solutions could be implemented at a much faster rate, and Natural Capital Accounting could be in place in many countries within the next decade. But, Natural Capital can only be effective if it's adopted voluntarily by both government and business. Enforcement takes too long and the stick causes loopholes, while the carrot accelerates the process. Why would a profit driven company be interested to implement and invest in Natural Capital? At first sight, business may not seem to have an interest in Natural Capital or Natural Capital Accounting, as it does not directly lead to profit. But there are several reasons why this is not only advantageous, but critical to the survival of business today and tomorrow. In complex supply chains, change comes quickly and strikes hard. Most companies rely on one or more natural resources somewhere in their supply chain, yet may not be aware of where and how. Tracking NC is essential to ensure continued business in the short and long term. If a sizeable business is not tracking this, it is not conducting proper risk management. In addition, business can use NC to find valuable ecosystems services while improving CSR performance at the same time. For example, companies have found bio-based alternatives to artificial or fossil resources that save money and provide long term sourcing security. It is also good for businesses to be ahead of the curve when it comes to issues that governments will eventually demand. Waiting to be forced into something through regulation risks costly solutions being enforced. Also, being one of the first to start NC accounting has its perks. It allows an organization to shape the conversation, be more opportunistic with investments, and get public recognition for leading the good fight. This has been shown by Puma, which started publishing the first Environmental Profit & Loss Account (EPLA) under direction of their holding company Kering, and already tracked 145 million in environmental impacts in 2010. This resulted in positive press globally, several companies following suit, and creating a catch-up game for everyone else. Lastly, insurance companies are becoming interested in Natural Capital Accounting. After all, threats to resources that a company relies on are threats to the company, and insurance will go up or become unavailable. And it is not just insurance firms. Standards & Poor’s, one of the Big-Three credit rating firms, is investigating Natural Capital Accounting as a new input for the same reasons, directly affecting a company’s credit rating. That should be reason enough for the big players out there to start moving. There are many reasons to start implementing NC as fast as possible. A structured and systemic approach is critical to make it succeed. This is why solutions like SiD exist. We call on the front runners of NC to aim higher and gain the advantage of using innovative systems tools and implementation strategies, such as natural currencies, crowd-solutioning and systemic risk assessment. The front runners in policy, business, and NGOs should be brought together to collectively accelerate the process and support each other. It is in our joint interest to do so. We have the tools, expertise, and manpower to do this, so let’s make Natural Capital accounting a reality within a few years, and gain huge benefits for each organization and society alike.